Tuskey Dressage began as simply a way of celebrating our passion for the horse, one of God’s most magnificent creatures. Our passion has grown and we now desire to share it with others. At Tuskey Dressage, we have come to realize that there is an overwhelming need for a change in modern horsemanship. In today’s day and age people are so focused on competitions and making a name for themselves, that they have lost touch with what it means to be a horseman. Classical training encompasses more than just riding. It includes everything from proper health care and nutrition, to groundwork, to work under saddle. We teach all aspects of caring for and training a horse, from foal onward. We are able to train our horses to the highest levels of dressage without any use of force. Dressage is a French word meaning “training”. Dressage is the art of horsemanship and riding. 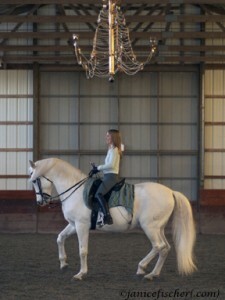 The horse is guided through a series of movements by subtle cues from the rider. During the sixteenth century, horse training was refined to an art and it later spread throughout Europe and became a competitive sport. Dressage is often referred to as “Equestrian Ballet”. If you’re wondering what the differe nce is between Competitive Dressage and French Classical Dressage, you’re not alone! Many people envision the French Classical Tradition as a fluffy, new age approach. In actuality, French Classical Dressage is rooted in centuries-old tradition of formal training aimed at suppling and strengthening the horse and forming a bond between horse and rider that enable the pair to accomplish extraordinary feats. French Classical Dressage is based on the principles developed by Francois Robichon de la Gueriniere, which emphasize lightness and purity. The horse is treated as a partner and the movements are given by, not forced from, him. 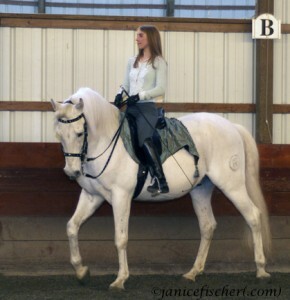 The rider allows the horse to perform without interfering with him. Only then can a true connection form between horse and rider. In French Classical Dressage, the ultimate goal is to honor the horse’s nature and promote health and inner harmony through the use of gymnastic movements on the ground and under saddle. This form of training is completed in the lightest of ways to encourage a natural willingness from the horse. The goal is to have a horse that is forward, relaxed, and focused no matter if he is completing a first level test, executing a perfect piaffe, going over jumps or just out on the trails. French Classical Dressage training can benefit any horse and rider, no matter the discipline or experience level.